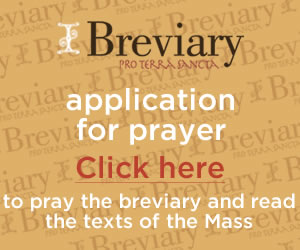 Have I Got a Lent Book for You! In which case I’ve got just what you need. 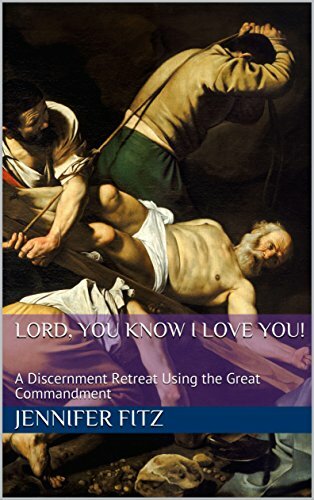 Lord You Know I Love You: A Discernment Retreat Using the Great Commandment is the kindle version of the retreat I wrote back in 2013 for the Pee Dee Council of Catholic Women. It goes through the four ways of loving God as outlined in the Great Commandment, and allows you to evaluate yourself, your ministry, or your faith formation class and see how things are going. The goal is to help you choose one thing that needs your attention most. It’s a really good book. My goodness who wrote this thing?? I still need the stuff that is written here. It’s tempting to try to tackle every one of our weaknesses at once. We want to be fixed, and we want to be fixed now! And yet God gives us a life to be lived out in time. We are meant to grow and change bit by bit. We’ll have times when we grow very quickly, and other times when we seem to be in a holding pattern. Sometimes it seems like we aren’t getting anywhere in the spiritual life. 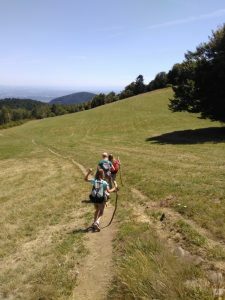 In those times, the very act of battling against ourselves – however unsuccessfully – can be building up an invisible strength that will bear fruit later. When we try to take on too many battles at once, we end up spread too thin. We’re unable to fight well. And a whole lot of other stuff, too. The Kindle version is out now, and a paperback edition is coming soon. 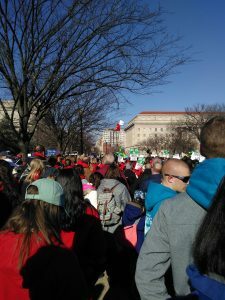 Between the Metro & the March and a museum visit, we walked 7.5 miles today. Turnout was enormous. 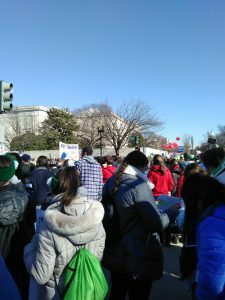 The column of marchers extended as far as you could see, filling the streets. One of the things people do is come in groups with matching hats, or scarves, or t-shirts, or sweatshirts — and in one case, yellow ponchos. Many of them are very memorable. 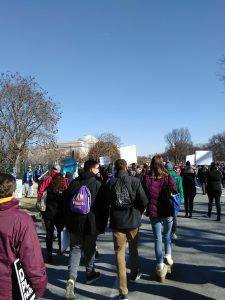 The March is so big that you’ll see thousands upon thousands of people, and then when you are walking to a Metro station afterwards, you’ll see groups gathered waiting for their tour bus that you never saw the entire day until you passed each other post-March. As the roads widen and narrow, and people walk at different paces, you end up here and there, walking alongside all kinds of different people. The caption at the bottom is: No hand is too small that it cannot leave an imprint on this world. And something amusing . . .
All dogs go to Heaven. All youth groups go to Air & Space. 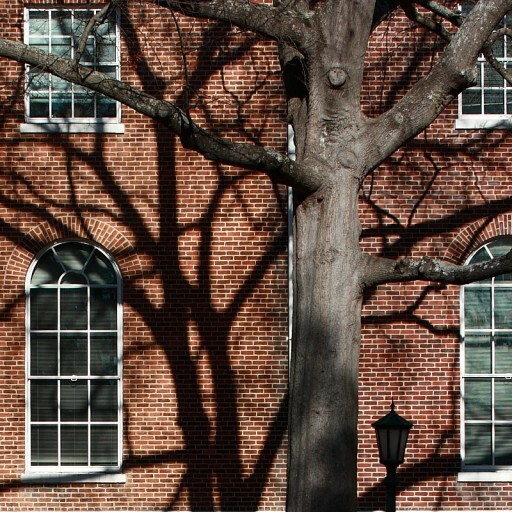 US History gets its share, too. 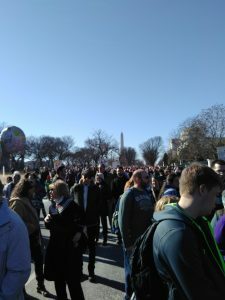 Somehow the first time I went to DC for the March I imagined we wouldn’t be allowed into the museums during the March. I guess I figured we were the rabble that had to be kept away from the innocent visitors. Actually: As long as you comply with the rules & regulations for the museum of your choice, you are welcome to come inside. 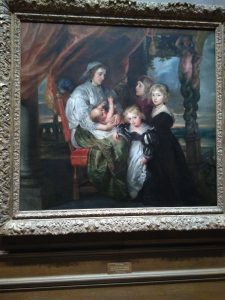 And hence this year I confirmed that if you want tranquility, and a surprising number of Dominicans, go to the National Gallery. You’ll spend $40,000 on lunch in the cafeteria (but it’s decent food). But maybe also you will be able to personally identify the person in art who looks most like yourself. The kids are little taller now. 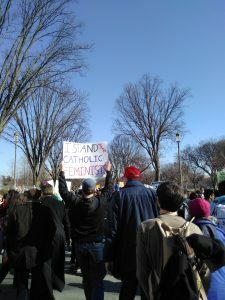 All photos & video by Jen Fitz except that one you can find on Wikimedia, Public Domain. 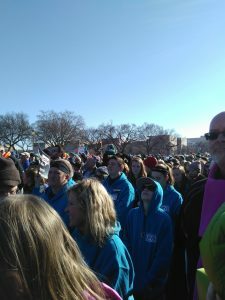 What do you when the interstate becomes impassable on your route to the March for Life? 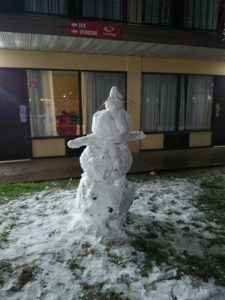 Pull over and make Phyllis, the snowperson. 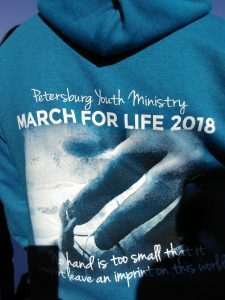 Why yes, the pro-life movement is young — and happy to be alive. 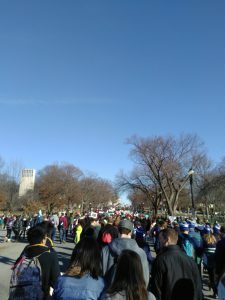 FYI if you didn’t see it over at the Register, this is what happened at our state March for Life, when a non-denominational Christian tried to talk my son and his friends out of being Catholic. This afternoon we’re going caroling with our friends (and you can too)! The way I buy out of the obligation to bring something good for the potluck is to bring the music instead. The booklets I put together back in 1998 for our first caroling party are starting to get a bit ragged. 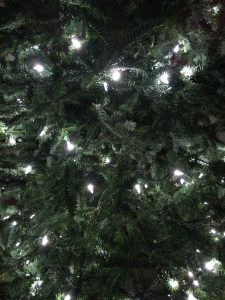 This is our year to refresh, and I suspected CCWatershed could help, since they were my source for Advent music a few weeks ago for the dread homeschool music-minutes. * For those who were in on the Advent Music brainstorming session on Facebook, the answer is that I went with “Creator of the Stars of Night.” Some people I live with were skeptical that young children could be counted on to quickly learn such a thing, but my class of monkeys had the hang of it by the third verse. So I maintain that one is a great choice for kids who can read words — simple tune, easy range, repeat repeat repeat. But for the neighbors, we need Christmas Carols. CCWatershed did not disappoint. I searched around and found their link to ACollectionofChristmasCarols.com. If you go to that site you can choose the format that works best for you. 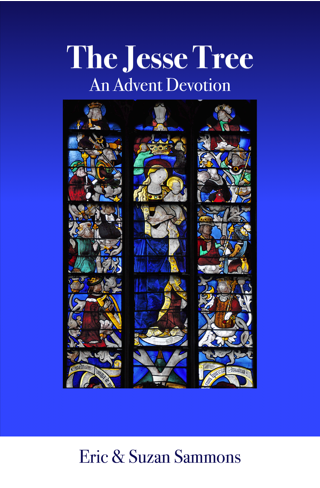 If you’re going out caroling on short notice, what you want to do is download the free PDF and print out just the pages you plan to sing from to make your booklets. If you want the whole shebang, you are way better off to purchase the book version from whichever of the several options best meets your needs. So You Want to Go Caroling, You Said? Let me give you a couple tips on how to organize your music. 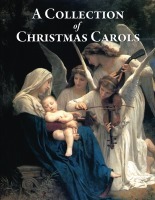 (1) Pick out six or seven carols that everyone and their brother is likely to know, and which are easy to sing. If your neighborhood has many people who do not celebrate Christmas, include some generic winter-season festive music in your line-up. You do not win hearts to the Gospel by irritating and offending people. (2) Choose two or three verses to sing for each song or carol. For slow songs like “Silent Night,” make it two verses. For quick, peppy songs you can do three. Decide ahead of time and make a note. DO NOT TRY TO SING MORE THAN ONE VERSE OF “THE FIRST NOEL.” Why yes, I am shouting at you. Trust me: Nobody in your group knows how to match the words to the melody in the subsequent verses. It will be a disaster. Don’t do this. “The First Noel” is a great song to not ever ever ever sing with your friendly neighborhood carolers. Just never. Leave that one at home. For “We Three Kings,” sing the first and last verse. You may sing all five verses at home with your friends. The police will be right to issue you a citation if you pressure your neighbors into standing there listening to the entire saga king by king. First and last and no one’s gonna hunt you down and egg your house. (3) Make yourself sets of three-song combinations. #3 is always “We Wish You a Merry Christmas.” #1 will be something lively, and #2 is where you can put “Silent Night” or any song that drags out a little. As you go from house to house, rotate through the combinations. If someone asks you for more than three songs, you can always throw in another one. (4) Use common sense when assessing whether to ring the doorbell and what to sing. If lights are off, don’t ring. If there are Christmas decorations up, it’s reasonable to assume the residents celebrate Christmas. FYI, the full lyrics of “Let it Snow” plus one verse and refrain of “Jingle Bells” is about the right amount for your non-Christmas houses. And my apologies gentle reader, I live in the Bible Belt, I don’t have a second secular-set to propose, because we don’t usually need even the first set. I’m sure your kid’s school Winter Concert playlist includes some suggestions. (6) The We-Wish-You finale (or “Jingle Bells” for non-Christmasers) is important not just because it works well for signaling to the neighbors that their time of redemption is at hand, but also it means that your toddlers will always have something they can sing at each house. Little kids do pretty well just dragging along and humming about Harold Angel, as long as they can belt out We-Wish-You with gusto for each song. “Away in a Manger” is good for little ones who’ve been made to learn it at Sunday School, and “Angels We Have Heard on High” works well because the pre-literate crowd can join in on the In Excelsis Deo. *Dreaded no longer. That class is going great ever since we switched formats. It turns out some of the wild monkeys are shockingly happy studying Tantum Ergo. And speaking of CCWatershed: I noticed the Cathedral in Charleston is using the Saint Isaac Jogue Pew Lectionary and the Pope Francis Hymn Book. Both of them look great. Recommended.